Jay Macy coached Bennington to multiple successful years, including an Eight-Man, Division I state runner-up in 1994, still the best finish in school annals. Macy served as principal at Bennington and then Minneapolis. Retired from education and now selling insurance, Macy decided he wanted to return to coaching. He talked to Bennington athletic director Jason Feil in May at church. Third-year Bulldog coach David Gillett brought Macy on staff as defensive coordinator. Macy put in many hours during the summer before he had an official contract. He switched the Bulldogs’ defense from a 3-3/3-4 last season to a 3-5 this year. Bennington’s defensive change and a switch to a ground-based, physical attack has helped the Bulldogs open 4-0 and emerge as one of this year’s surprise contenders. Bennington finished 2-7 in 2016 in its first season after returning to eight-man football. In 2016, Bennington scored 36 points a contest but permitted 52.7. This year, the Bulldogs have an average of 53-12. Gillett said Centre-Lost Springs is the only other eight-man team that he’s aware of that uses a similar defense to Bennington. “It’s been a great fit, and it’s been a pleasure to have him on our staff,” Gillett said. Bennington is part of the mix in challenging District 4 that includes defending state champion Osborne (3-1), Victoria (3-1), Logan-Palco (4-0) and Solomon (3-1). The Bulldogs are part of a group of Division I teams that could unseat traditional powers/ranked teams. In District 1, Madison, 3-6 last year, is 4-0 with second-year coach Alex McMillian, a former Victoria assistant. The Bulldogs could challenge St. Paul, West Elk and Sedan, all undefeated. In District 7, South Gray is 4-0 after just three wins the previous two years. Eight-man has recently had multiple state championship participants from teams who spent most of the year outside of the top-five, including Division I South Gray in 2011, Rock Hills in ’12 and Hodgeman County in ’13. Central Plains was considered a surprise champion in ’14. Division I Osborne and Division II Dighton each had massive improvements from 2015 en route to Newton last fall. Gillett said Bennington has talked little about big-picture ramifications at this point, but the Bulldogs are aware of the other district teams’ performances. Four of Bennington’s top-five tacklers are non-seniors. Junior Layne Wilton has a team-best 41 stops. Junior outside linebacker J.T. Ohlson (35 tackles), sophomore safeties Javon Allen (31 tackles) and Tyler Stanley (23 tackles) are among the leaders. Seniors Ethan Schlachter and Skylar Piepho start at defensive line. Senior Taygen Watson is 5-foot-10, 160 pounds and starts at nose guard/center. Since the summer, Gillett has been pleased with how the team “really bought into” the new defensive scheme and improving on that side. Gillett noticed a difference in the team’s scrimmage before the year and then more improvement in a 52-6 season-opening win against Herington’s single wing. Junior starting linebacker Clayton Gish suffered a knee injury in Week 1 and is out for the year. In Week 2, Bennington won at Little River, 42-20, still the Redskins’ only loss. LR defeated Solomon in Week 4. “I am trying to build a program here, and to have young guys buy in like that and want to take a big part in it really goes a long ways for the continuation of our program,” he said. Last season, Bennington averaged 4.6 yards per carry and 167 rushing yards a game with 69 percent of its snaps coming on the ground. Standout J.J. Allen had 144 carries for 855 yards and 16 scores. This year, Bennington has rushed for 7.4 yards per carry and 297 yards a game with 92 percent of snaps coming on rushes. Allen, a senior and one of eight-man’s most dynamic players, has 76 carries for 754 yards and 17 scores. He has exceeded 100 yards in each contest. Defensively, he leads with five TFLs as the middle linebacker. Senior Devin Feil returns at quarterback. Gillett, a 2000 Mankato graduate and uncle of current Rock Hills junior quarterback Dereck Gillett, told the team heading into summer camp that he wanted a run-heavy look. Bennington rushed for 354 yards versus Little River. Madison (4-0) – After suffering through a 3-6 record last season, the Bulldogs are 4-0 overall and 3-0 in the Lyon County League. In four games, Madison has scored no fewer than 46 points and allowed no more than 22. It is coach Alex McMillian’s second season as head coach of Madison. Previously, he was an assistant on state championship teams at Victoria. Sedan (4-0) – The Blue Devils returned only three starters on offense and four on defense from last year’s team that finished 8-1. However, that hasn’t prevented Sedan from going undefeated so far. Junior running back Cody Joslin leads the offense with 511 rushing yards and eight touchdowns on 71 carries. Sophomore quarterback Tayte Halderman has rushed for 406 yards and seven touchdowns, while passing for 204 yards and five touchdowns. St. Paul (4-0) – The Indians are building off the momentum from last season when they advanced to the playoffs and finished with a 9-2 record. St. Paul won the district championship last year and made the playoffs after failing to do so the four previous seasons. The Indians finished 1-7 the year before Keith Wiatrak took over the program in 2014. Since then, Wiatrak has led St. Paul to a 22-11 record. West Elk (4-0) – Starting with the 2015 season, Chris Haag’s Patriots are 15-0 in the South Central Border League. So far this season, West Elk has outscored its four opponents by a combined score of 202-12. Senior quarterback Cade Miller leads the Patriots offense as he’s rushed for 481 yards and 11 touchdowns on 39 attempts. He’s also completed 14 of 24 passes for 365 yards and seven touchdowns with only one interception. Marmaton Valley (3-1) – Against its three Kansas opponents (Chetopa, Colony-Crest, Altoona-Midway), the Wildcats won by a combined score of 174-0. However, Marmaton Valley fell 58-20 in Week 3 to Missouri foe Greenfield. Senior running back Trevor Wilson rushed for 186 yards and three touchdowns on only seven carries in the 68-0 win over Chetopa. Southern Coffey Co. (2-2) – The Titans are fresh off a 52-6 win over Hartford, but they also have suffered two shutouts this season in losses to Burlingame (57-0) and Hanover (50-0). In fairness, however, Burlingame is ranked No. 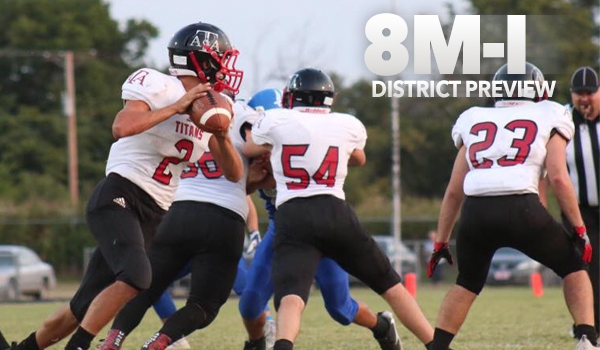 2 in 8-Man Division I, and Hanover is the top-ranked team in 8-Man Division II. Last week’s win over Hartford was SCC’s first victory in the last two years against a team not named Waverly. Cedar Vale-Dexter (2-2) – The Spartans have alternated losses and wins through the season’s first four weeks. After being shutout in losses to Sedan (44-0) and West Elk (48-0), Cedar Vale Dexter has scored 52 and 54 points in wins over Altoona-Midway and South Haven. Since the co-op of Cedar Vale and Dexter, the Spartans are 26-43 with playoff appearances in 2010 and 2014. Oxford (2-2) – The Wildcats finished 7-3 and reached the postseason last year ending a nine-year playoff drought. This season, Oxford has posted big wins over South Haven and Stafford while being blown out by West Elk and Sedan. Senior Dalton Silhan is averaging nearly 150 rushing yards per game, while classmate Callen Shimkus is also a key component in the Wildcat’s offense. Peabody-Burns (1-3) – The Warriors dropped three straight games to open the season before last week’s 44-38 win over Goessel. Peabody is being outscored by an average of 46-24 this season. The Warriors have typically been a playoff contender having reached the postseason in 5 of the 7 seasons since switching to 8-Man. Udall (1-3) – Udall has played a challenging scheduled with losses to Caldwell, Hanover, and Sedan; three teams that are a combined 12-0. The Eagles blasted South Haven 62-16 in their only home contest of the season. Freshman Dylan Bishop leads the Eagles in rushing with more than 250 yards and 4 touchdowns. Senior Dylan Loos and junior Joshua Fielder have each contributed three rushing touchdowns as well. Central Burden (0-4) – The Raiders may be winless, but they’ve dropped some close games to good teams. Central Burden’s opponents are a combined 15-1 this season. The Raiders fell to Argonia-Attica 38-20 and Sedan 24-22 before blowout losses to Caldwell and West Elk. Flinthills (0-4) – The Mustangs have dropped 28 consecutive games dating back to a 42-8 victory at Elk Valley in September 2014. Flinthills has been more competitive as of late with a 34-26 loss to South Haven back in Week 2. The Mustangs also scored 22 points in a loss at Caldwell last week. Clifton-Clyde (4-0, 2-0 district) – The Eagles are undefeated and haven’t really been challenged to date. Clifton-Clyde has outscored its four opponents 231-12 this season. A trio of backs have led the Eagle offense to date with juniors Drake Steinbrock and Christian Seifert and sophomore Aiden Rudolph. Steinbrock has six rushing touchdowns and both he and Seifert are capable options catching the ball as well. Burlingame (4-0, 1-0 district) – One of the top ranked teams in the classification, Burlingame got a big boost with the return of all-state quarterback Dalton Sporing in the last two weeks. Sporing, who was recovering from a knee injury suffered during last basketball season, has passed for 176 yards and four touchdowns in two games since returning. Junior Montana Giffin filled in nicely in passing for 310 yards and seven touchdowns. Junior Seth Greenwood has contributed nearly 250 rushing yards and seven scores. Centre-Lost Springs (2-2, 1-1 district) – The Cougars will have a week off during Week 5 with a chance to try and recoup from a 58-12 loss to Burlingame. The loss snapped a two-game win streak where Centre averaged 64 points per game. The Cougars playoff hopes may now ride on beating Clifton-Clyde in Week 7. Rural Vista (2-2, 1-1 district) – The Heat have alternated wins and losses under first-year coach Adam Flowers. Rural Vista beat Peabody-Burns and Onaga, but have been blown out in losses to Canton-Galva and Clifton-Clyde. The Heat should get back on track this week against winless Valley Falls before a non-district game against Hill City. Herington (1-3, 1-1 district) – The Herington football program won just 11 games from 2005-15, but posted a strong 7-2 campaign in its first in 8-Man last year. Still the Railers missed out on the playoffs, a goal the Railers haven’t achieved since 2002. Graduation hit hard including four-year standout Tate Becker, but Ethan Mooreman-Meador has stepped up as the Railers primary offensive threat. Valley Falls (0-4, 0-1 district) – Valley Falls has lost 12 straight games and has been outscored by an average of 65-12 this season. The Dragons last win came against Wetmore in the 2016 season opener. Remember the Dragons were on the short end of that wild 114-68 district finale loss to Onaga last year. Onaga (0-4, 0-2 district) -- Onaga is has posted a 2-11 record in its first 1.5 seasons of 8-Man football. The Buffs have started 0-2 in the Twin Valley League and 0-2 in district play this season. Senior Tanner Marten (6-4, 220) has been a workhorse after missing most of his junior year with an injury. Marten has averaged more than 60 percent of Onaga’s carries this season and has put up more than 200 yards per game on the ground. Bennington (4-0) – The Bulldogs have been one of the eight-man surprises through the first month, including a win against 3-1 Little River. Senior J.J. Allen has 76 rushes for 754 yards and 17 rushing scores. Bennington has already doubled last season’s win total. Logan-Palco (4-0) – The Trojans, 18-4 in their last 22 games, look to gain an elusive playoff spot after back-to-back 7-2 seasons. Logan-Palco has rolled through a softer schedule and outscored teams 226-22. Senior David Thompson has 45 carries for 579 yards and 10 rushing touchdowns. Senior Riley Allen has stepped in well at quarterback with eight scores accounted for. Osborne (3-1) – Defending state champion Osborne’s 16-game winning streak ended last week with a 30-28 road loss to Pike Valley. Osborne permitted 18 unanswered fourth-quarter points, and Pike Valley intercepted the Bulldogs’ pass in the end zone on the game’s final play. Senior Denton Schurr, junior Darnell Holloway and sophomore Darrien Holloway have recorded between 300 and 501 rushing yards and combined for 22 rushing scores. Solomon (3-1) – Solomon, the district runner-up behind Osborne last season, lost to Little River in Week 4. The Gorillas have reached the playoffs four of the past five seasons. Junior Braden Neilson has completed 25 of 50 passes for 392 yards with a 9/2 TD/INT ratio. He has rushed 51 times for 420 yards and eight scores. Victoria (3-1) – Victoria, 5-4 in 2016, has permitted just 13 points a contest after it allowed 31.6 last season. The Knights split a pair of high-profile games: a 34-8 season-opening road win versus Central Plains, and a 22-20 road loss to Otis-Bison last week. Senior Collin Kisner has 50 rushes for 548 yards and nine rushing TDs. Lincoln (1-3) – The Leopards opened with a 48-0 road win against Tescott and then dropped three in a row, including 44-42 at home versus Beloit St. John’s-Tipton last week. Lincoln is 2-11 since the start of ’16. Key games: Every game is key in arguably the state’s best district from top to bottom. While Lincoln has won fewer games than the other district teams, even the Leopards can play a key role in playoff spots that could be determined by the points tiebreaker. Central Plains (3-1) – Central Plains, ranked first in the classification to open year, lost 34-8 against Victoria to start the fall. Since then, Central Plains has won three straight, including a Week 3 home contest against Otis-Bison, 36-12. Otis-Bison defeated Victoria last week, 22-20. Central Plains has captured 20 straight district contests with the closest margin at 16 points. Quarterback Myles Menges, a transfer from Ellinwood, has completed 21 of 38 passes for 348 yards with a 7/2 TD/INT ratio. Little River (3-1) – The Redskins, runner-up to Central Plains last fall with a 4-6 record, has started with three wins in the first month, including a quality 50-26 road victory against Solomon last week. Seniors Levi Swenson, Peyton Harvey and junior Hunter Thomas have between 216 and 321 rushing yards and a combined 20 rushing scores. Sophomore Brayden Sears has tallied 54 tackles, while Harvey has five tackles for loss, both team-bests. Canton-Galva (2-2) – Canton-Galva went through a coaching change just before the season opened when Shelby Hoppes replaced Dustin Patee. Canton-Galva had a 3-15 mark the last two year but could finish with its first winning season since ’14. The Eagles have not won more than five games in a season since 2005. In Week 3, the Eagles defeated Peabody-Burns, 46-0, and ended a five-game losing streak in the series. Ellinwood (1-3) – Ellinwood also went through a coaching change before the year started as Alex Birney took over for Jason Duvall. The Eagles opened with a 30-0 victory against Kinsley and then lost three in a row. St. John (1-3) – St. John’s lone victory came in a Week 2 road game, 56-24, against Kinsley. After a winless 2015, the Tigers finished 3-6 last year with victories versus Kinsley, Macksville and Ellinwood. Goessel (0-4) – The Bluebirds have struggled defensively with 226 points permitted. Goessel’s closest game came in a 44-38 home loss in Week 4 to Peabody-Burns. Argonia-Attica (3-1) – A&A has split a pair of high-profile games against Division II’s Caldwell and South Barber, teams that are a combined 7-1. The Titans lost, 38-20, at Caldwell in Week 2, and defeated South Barber, 34-30, last week in Attica. A&A has made the playoffs three straight years and has posted a winning record each of the first four seasons in the co-operative agreement. The Titans have struggled with 12 turnovers and stand at minus-2 in turnover margin, though have produced nearly 300 yards per contest. Macksville (3-1) – Macksville, which last made the playoffs in 2011, is now 7-5 in its last 12 contests. Prior to then, the Mustangs had been 2-25 in the last three seasons. Junior Kody Mead has completed 42 of 73 passes for 684 yards with a 16/2 TD/INT ratio. Three receivers have between 178 and 247 yards. The Mustangs’ only loss came in Week 2, a 60-12 road defeat against Victoria. South Central (3-1) – South Central has made statewide news when Zach Jellison, born with spina bifida, scored a one-yard touchdown in a Week 3 win against Ingalls. The T-Wolves, 9-2 and district champions last season, have made the playoffs four straight years and nine times since ’02. Sophomore Chayde Snyder has completed 15 of 22 passes for 238 yards and a pair of scores. Senior Cabe Lindsay leads with 34 tackles. Kiowa County (2-2) – The Mavericks have posted a W-L-W-L pattern in the first four games with no margin closer than 34 points. Kiowa County lost, 68-34, at Ingalls last week. Sophomore Cooper Zenger and juniors A.J. Owens and Cale Thompson have tallied between 197 and 256 rushing yards with 15 combined rushing scores. The Mavericks’ 24-player roster has four seniors, none of whom play a significant role in the offensive skill positions. Pratt-Skyline (1-3) – The T-Birds lost their first three games before a 46-0 home win against Norwich last week. Skyline has five victories since the start of the 2015 season after an 8-2 season in ’14. Fairfield (0-4) -- Fairfield has permitted 66, 54, 54 and 64 points in its four losses. The Falcons have lost 12 straight contests. Satanta (4-0) — Satanta has posted three straight winning seasons and could enjoy its best record since it switched to the eight-man ranks six years ago. The Indians have outscored teams, 174-14. Through the first month last season, Satanta went 3-1 with a total margin of 162-50. Junior Gabe Salas and senior Ty Blair have combined for 932 rushing yards and each have eight rushing touchdowns. South Gray (4-0) — The Rebels had posted a combined five wins from ’14-16 before a surprising 4-0 start this fall. South Gray has not had a winning record since its surprise 11-1 season and run to the state championship game in 2011. Junior Austin Jantz has completed 23 of 41 passes for 306 yards with a 7/1 TD/INT ratio. Senior Brandon Davis and Jantz have combined for 15 rushing scores. Spearville (4-0) — The Lancers, 38-2 since the start of 2014, have continued to roll and own a marquee win at rival Hodgeman County, 64-34, in Week 2. Junior Kolby Stein has completed 10 of 10 passes for 321 yards with five touchdowns. He and senior Bailey Sites have combined for 625 rushing yards and 15 scores. Spearville has one turnover this season and is plus-eight in turnover margin. Leoti-Wichita Co. (2-2) — Wichita County is 7-6 since moving to the eight-man ranks. Both of the Indians’ leading rushers are freshmen with A.C. Hermosillo and Jesse Gardner combining for 306 yards and five scores. Ness City (2-2) — Ness City, 7-3 last season and the district runner-up to Spearville, has passed for 116 and rushed for 112 yards a contest. The Eagles permitted 104 points in the first two weeks before 56-6 and 46-22 wins the last two Fridays. Junior quarterback John Pfannenstiel has accounted for seven touchdowns. Kinsley (0-4) — The Coyotes have lost 16 straight contests. Kinsley has tallied just 30 points this season. St. Francis (4-0, 2-0 district) - The defending state runner-up Indians have not lost in the regular season under third-year coach Rodney Yates. Sainty has permitted one touchdown this fall. St. Francis has a total margin of 208-12 with its bevy of talent that includes junior running back Jordan Raby, senior wide receiver Tate Busse and senior lineman Trayton Doyle. WaKeeney-Trego (2-2, 1-0 district) – The Golden Eagles have posted W-L-W-L through the first four weeks. The Golden Eagles opened 3-0 in 2016, and then lost its final six games. Junior Keagan Shubert completed 61 of 112 passes for 550 yards with an 8/7 TD/INT ratio. Junior T.J. Hafliger (42 tackles) and senior Shaye Aumiller (eight TFLs) have led the defense. Hoxie (4-0, 1-0 district) - The Indians opened 2-2 last season with losses to Wallace County and Atwood-Rawlins County but have beaten both of those teams this year, including a key 22-6 home win versus the Buffs last Friday. Hoxie is No. 1 in the classification in scoring defense with just six points permitted. Senior Latham Schwarz has 65 carries for 457 yards and 11 scores. Senior Chris Cox, a transfer from Oakley, leads the Indians with eight TFLs. Atwood-Rawlins Co. (3-1, 1-1 district) – Atwood lost a key game to Hoxie last week. The Buffs are 10-3 under second-year coach Matt Smith. Senior quarterback Maverick Green has accounted for more than 850 yards of total offense and has 14 TDs accounted for. Hill City (2-2, 1-1 district) - The Ringnecks have alternated L-W-L-W with losses to state powers St. Francis and Spearville. Senior quarterback Ethan Hamel has passed for 492 yards with a 4/5 TD/INT ratio. He leads the team with 34 carries for 330 yards and seven scores. Oberlin-Decatur Comm. (0-4, 0-2 district) - Oberlin has scored just 48 total points and permitted 62, 53, 48 and 54 points in its four losses. Oberlin has lost six straight contests dating back to last season..
Quinter (0-4, 0-2 district) – Quinter has lost 24 straight contests, the second-longest current eight-man streak behind Flinthills. The Bulldogs have struggled with numbers the last couple of seasons and have just 14 players listed on the roster.